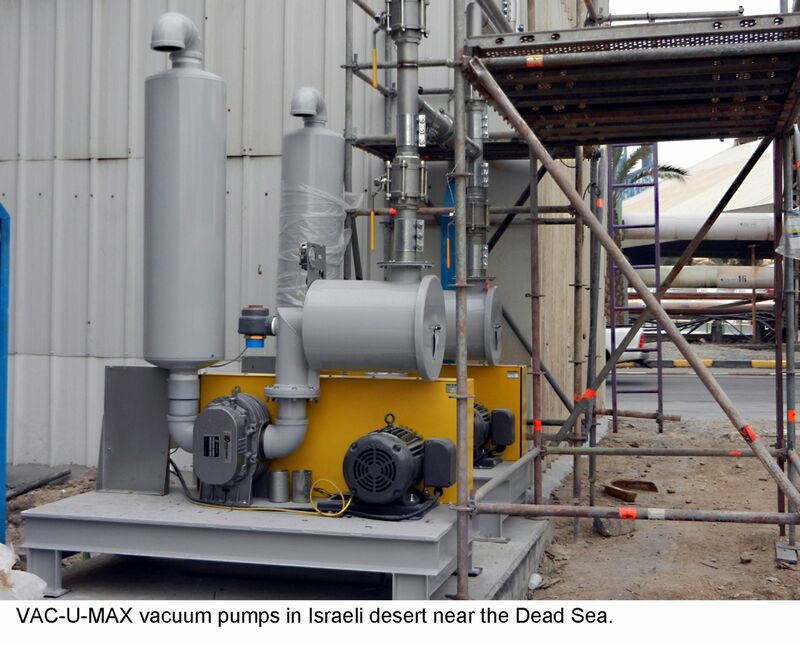 Vacuum conveying system engineered to operate flawlessly 24/7 in Israel’s harsh corrosive Dead Sea environment. When Dead Sea Works Ltd, (DSW), one of the world’s largest producer and supplier of potash products, decided to expand its Dead Sea facility product line to include potassium chloride suitable for food and pharmaceutical applications, Project Manager, Vlad Golick, was tasked with developing a proper area to package the pharmaceutical product into 55 lb and 2000 lb super sacks, and also a material handling system to transfer the product to the packaging equipment. Because the plant operates 24/7 there is no margin for error and Golick had to ensure that the equipment could withstand constant operation in the harsh desert environment, was user friendly, and interact flawlessly with the hydroscopic nature of the product. 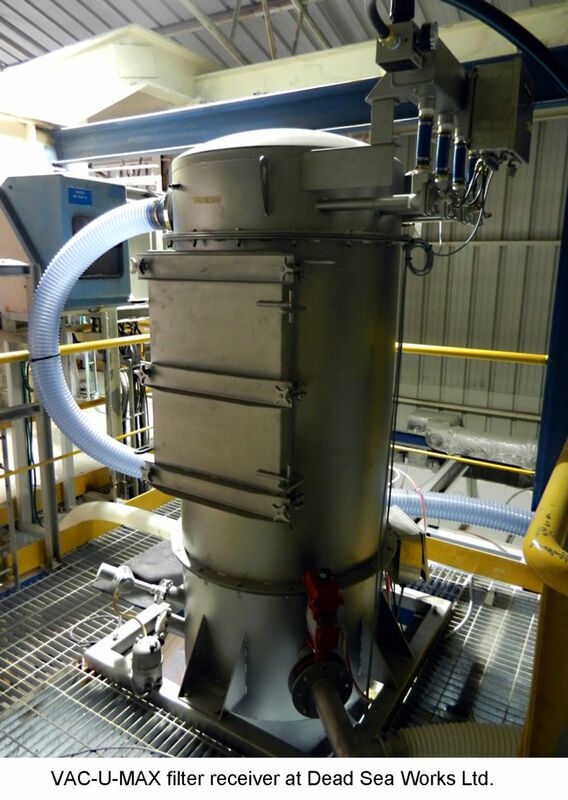 The solution was a semi-custom engineered vacuum conveying system. “To accommodate the new product, a sanitary room was constructed 30 feet from the old packaging area and we required a conveying system that could move the product horizontally 30 feet and 14 feet vertically,” says Golick. Golick and his team investigated several material handling solutions, including belt conveyors and bucket elevators, to move the material but those methods exposed the product to the environment and were problematic for moving material vertically. Pneumatic conveying seemed like the right choice, but because potassium chloride is highly hydroscopic and tends to clump Golick was concerned that ambient air would come into contact with material during the conveying cycle and cause the product to solidify. In very simple terms, pneumatic conveying is the method of using air to move bulk dry product from place to place within a factory. There are two types of pneumatic conveying, vacuum and pressure. Vacuum is where the system is sucking the material through the tube and pressure is where material is blown through the tube. While ambient air does come into contact with the product when pneumatically conveying materials, conveyor experts know how to minimize the effects so that it does not affect materials. “We contacted suppliers in Europe, and VAC-U-MAX in the U.S. Its systems are well known in Israel, and the company had the technical expertise we were looking for,” says Golick. Belleville, New Jersey-based VAC-U-MAX, an expert in the design and manufacture of pneumatic systems and support equipment for conveying, batching, and weighing of dry materials, couples its proven pre-engineered conveying solutions with industry expertise to design custom solutions for processors. Recognizing that materials behave differently under various conditions, the conveyor manufacturer has a long-standing practice of offering no obligation test runs of customers’ materials in their testing facility, and DSW sent samples of its product for test with the equipment. Before running any tests, the conveyor manufacturer had to first consider the unique location and environment of the application and design the system using high temperature materials and also materials that are corrosion resistant—which is a whole subject in itself. It was decided that a conveying system built from 316L stainless steel could withstand the harsh desert temperatures and corrosive atmosphere at the Dead Sea. With the equipment material decided, VAC-U-MAX tested the hydroscopic material to ensure it would not absorb moisture and clump in the conveying tube and packaging equipment. To prevent this, the conveyor manufacturer tested and employed flow promotion devices such as aeration, agitation or vibration to keep the material moving with a transport weight of 5.5 tons per hour. Beyond environmental factors, Golick says, “the equipment needed to be user friendly so that different language groups can operate it.” The national language of Israel is Hebrew and Arabic, and English and Russian are the most popular unofficial languages in Israel. Therefore, the system is fully automated to run 24/7 with 30 operators rotating off with no operator attention required except to push a start button. “The two systems have been up and running since the beginning of the year and they are working without any problems so far,” says Golick. VAC-U-MAX offers a wide range of standard pneumatic conveyor systems, weighing systems and accessories, plus semi-custom systems, as well as totally custom-engineered systems. They offer factory testing of trial materials, as well as installation assistance and full maintenance documentation. They are the provider of choice of many well-known companies in the food, drug, and industrial manufacturing sectors. For more information about VAC-U-MAX pneumatic conveying systems, or to learn about the company’s industrial vacuum cleaners write to them at 69 William Street, Belleville, NJ 07109; call 1-800-VAC-U-MAX (800) 822-8629 or (973) 759-4600; e-mail info@vac-u-max.com; or visit their website www.vac-u-max.com.